Skidmore’s baseball team will compete in 39 regular season contents with the hope of clenching its sixth Upstate(UCAA)/Liberty League Championships title. The Thoroughbreds, led by seniors Jacob Berish ‘19, Will Potter ‘19, Patrick Geiger ‘19, and Spencer Anderson ‘19, started their session with eight games in Fort Myers, Florida, competing in the Gene Cusic Classic. On the pitching side, both Anderson and Potter — each an All-Liberty League selections — will return to the mound. In the infield, Geiger returns as a two-time All-Liberty League selection. Last year, he continued to dominate as a primary component of the pitching side, while also being a valuable part of the infield team. Nate Scheinman ‘20, Zach Bunker ‘21, and Justin LaRose ‘20 will return to the infield, accompanied by five rookies that will fight for starting positions. The outfield will consist of Matt Chipkin 20’, who is returning to center field after leaving last season due to injury. Justin Bottcher 20’ and Sam Browning 21’ will also play outfield, along with freshman Christian Italiano ‘22. The team is currently 5-3, and will play Southern Vermont college (Apr 6) for the home opener. The team will compete in forty regular season contents, with sights set on a Liberty League Tournament spot. They have earned a tournament appearance in four of the last five seasons. The Thoroughbreds are led by senior Karly Fishkin ‘19 and sophomore Emily Popp ‘21, who were All-Liberty League honorees last season. Popp will start as pitcher, coming off of the 2017-18 season with fifty innings, striking out 38 batters. In the infield, Maddie Nelson ‘20 will return as catcher, accompanied by middle infield duo Fiskin and Hannah Paolucci ‘21. The outfield will be patrolled by junior Heather Mak ‘20 and freshman Kaitlyn Judd ‘22 and Dana Ragen ‘22. Skidmore opened their season in Arizona, taking on the Bethany Lutheran College (5-2), University of Wisconsin- Platteville (1-0), and seven other teams. Back in New York, the team is 3-6 and will start Liberty League play with a doubleheader against the University of Rochester (Apr 6) and RIT (Apr 7). The Thoroughbreds will hope to better their season record as they play three opponents currently ranked in the National Fastpitch Coaches Association (NFCA). The men’s lacrosse team will be looking to improve upon their eight-win 2018 season — the team’s best since the 2011 season. The team is led by seniors Eric Megnia ‘19, Colby Farnham ‘19, Logan Hart ‘19, and junior Colin McClure ‘20. The Thoroughbreds will play 16 regular season contents, including nine at home. Megnia returns as leading scorer for the Thoroughbreds, tallying 47 points in 2018. Joining him on attack is All-Liberty League honoree Will Lukas ‘20. All-Liberty selections Jason Shlonsky ‘21 and Alex Miller ‘21 will lead the midfield, after having a strong freshman season. Senior Tim Rahill ‘19 will start as goalie after playing in six games last season with a 11.94 goals against average. Rahill is joined by four other goalies, who will look for a starting spot. After dropping their season opener to Babson (15-9), the team earned its first win against Oneonta (12-10). The Thoroughbreds stand at 2-4 overall and will look to improve as they take on Union College (Mar 23), St. Lawrence (Apr 6), RIT (Apr 13), and Vassar College (Apr 24) at home. The Thoroughbreds vs. Cancer game will be played on Wachenheim Field, Mar 26 at 4pm. 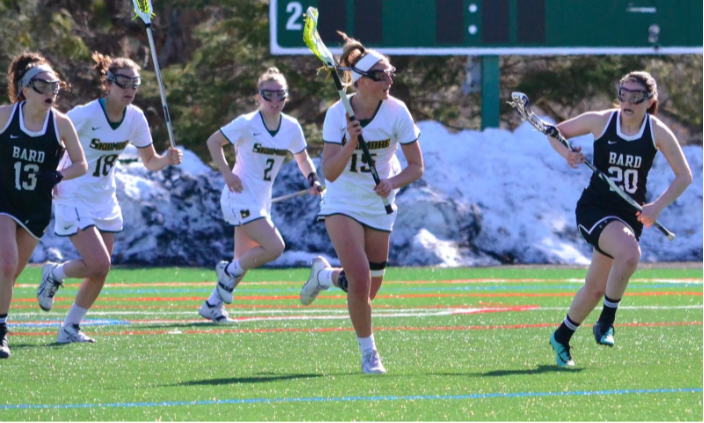 Leading the Skidmore College’s women’s lacrosse, who currently are ranked 24th for D3 programs, team are seniors Cas Szwajkowski, ‘19 Natalie LaBeau ‘19, Frankie White Levin ‘19, and junior Amanda Cagnassola ‘20. In the Liberty League preseason poll, the team was picked to finish third this season. Currently standing with a 3-2 record — including wins against Babson College (14-7), Westfield State University (17-10), and Haverford College (16-15) — the Thoroughbreds are strong. Captain Szwajkowski returns as one of the best attackers in the league, earning the Intercollegiate Women's Lacrosse Coaches Association (IWLCA) All-Region honoree title twice last season. Just this past month, she passed the 200 goal mark [stats]. IWLCA All region team members, LaBeau and Emily Hirsch ‘21 will lead the midfield team. Amanda Cagnassola ‘20, Daly, and Gianna Muscari ‘19, who have started for the past three years, will comprise Skidmore’s defense. Starting in goal last season was Caroline Kenlon ‘20, who will fight for the starting spot with fellow goalie Nicki Eckert ‘20. Playing a strong schedule this season, the women’s team will play NCAA tournament participants William Smith College, Babson, Trinity, and Westfield State. In Liberty League play, the Thoroughbreds will look to improve their standing as they face league foe Ithaca College. The men’s and women’s crew teams traveled to Tennessee for spring training and are ready to begin their season, which will begin by competing against the University of Vermont on Apr 7. The Thoroughbreds will then compete in The Busfield Regatta (Apr 13), and later against the University of Massachusetts Lowell (Apr 20), Worcester Polytechnic Institute (Apr 21), and Albany and Vassar (Apr 26), which will make up their season. 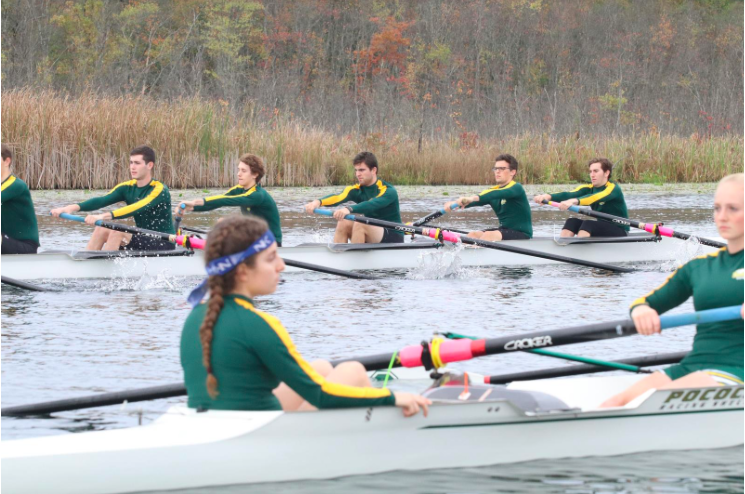 Both teams hope to make appearances in the Liberty League Championship regatta (May 3), the New York State Championships (May 5), and the National Invitational Rowing Championships (May 11-12). 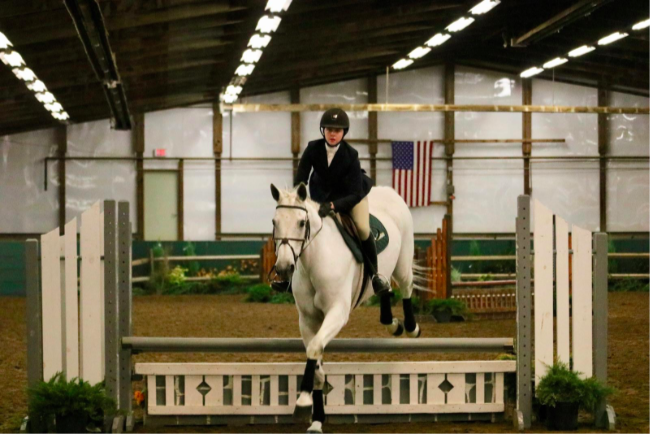 The Skidmore College riding team, led by senior Sheridan Beard ‘19, finished their regular season undefeated and will look to defend their national championship title. The team started its spring opener with a perfect win — twenty points in front of second place. It was only uphill from there, as the Thoroughbreds clinched first place show after show. The Thoroughbreds will host the Region 3 Finals (Mar 31), before traveling to the Zone 2 Finals (Apr 6). They have their sights set on a ninth Intercollegiate Horse Shows Association (ISHA) championship title at the IHSA Nationals (May 2-5). The men’s and women’s tennis teams will look to maintain their status as one of the country’s best D3 tennis programs. The men’s team is currently ranked 26th in the country, with a record of 8-4. With a win against Vassar (8-1) at the season opener, the team carried that stamina, earning victories against St. Lawrence University (9-0), RIT (9-0), New York University (9-0), and Bard College (9-0) for a four straight sweep. The Thoroughbreds played some of the nation’s best teams at the Stag-Hen Invitational, clinching victories against fifteenth ranked Gustavus Adolphus University (6-3) and fortieth ranked Southwestern University (6-3). The men will look to continue grabbing victories as they head into Liberty League play. On the women’s side, the fourteenth ranked Thoroughbreds started their spring season off strong, picking up victories against Bowdoin College (5-4), St. Lawrence University (9-0), and RIT (9-0). With a record of 6-3, the women’s team enter the second half of the season strong gearing up for the Liberty League and NCAA tournaments.